We get it. From driving the kids to school and getting to work in the morning, to running errands and cooking dinner in the evening, there never seems to be enough hours in the day. And as we prioritize our day-to-day activities it can be easy to put house cleaning on the backburner. But whether you live in a studio apartment or a five bedroom home, making time to tidy up can be much easier with a set cleaning schedule. 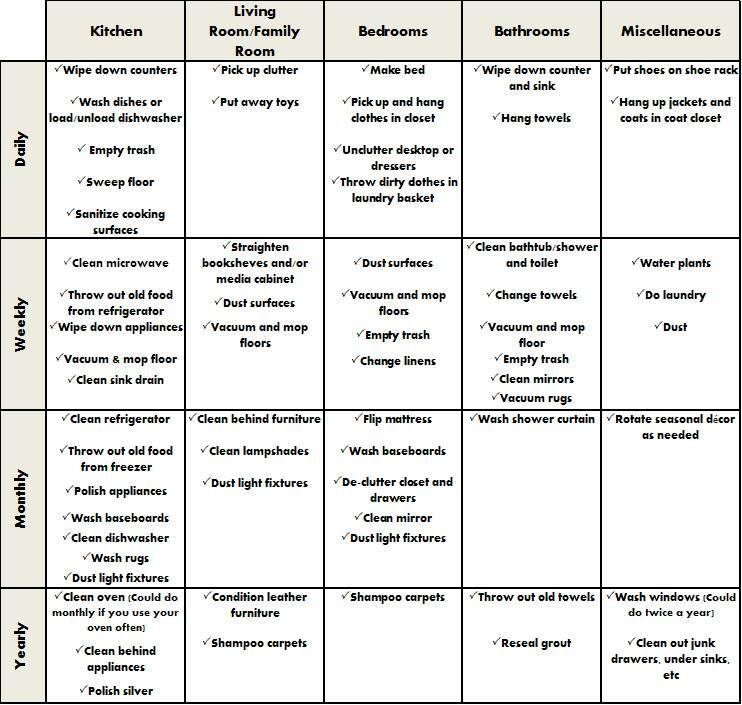 They key for many is to use a premade housework schedule to organize chores for each room, and then designate daily, weekly, monthly and yearly tasks to tackle. Once you’ve built your schedule, distribute chores between yourself, children, spouse, significant other, roommates or whoever else lives with you. You can use different colored highlighters to indicate who is responsible for which chore. (Living solo? You might not be able to share chores as easily, but the good news is that fewer people often means less mess to clean up!). Hint: Give kids a choice in which chores they are assigned—in many cases they will be more inclined to do a chore without too much grumbling if they have a say. Hint: Let everyone be responsible for the daily tidying of their own bedroom. Even very young children can help throw clothes in a hamper or put toys away. Keeping up with chores doesn’t have to feel overwhelming; scheduling tasks on a daily, weekly, monthly and yearly basis can help make cleaning more manageable. And when everyone is involved and plays a part, cleaning can even be (dare we say) fun! How do you organize your chores at home? Share your ideas on the S.O.S Facebook page or tweet them with the #SOSWhoKnew hashtag. Don’t forget to follow us on Facebook, Twitter and Pinterest, too! I like the arrangement of the cleaning schedule from daily, weekly and monthly. I will copy these steps and follow. Thanks! Fantastic! I will print this and put it on the fridge! Best regards! Awesome tips. These are really helpful. Thanks for sharing. Awesome tips.I was glad to read this post as it contains some great knowledge. I hope people like this post and bookmark this blog because it contains some great information. Thanks!